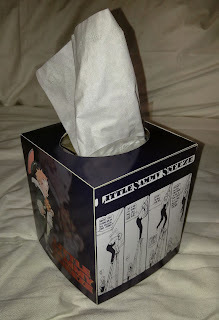 OK, I swiped this idea from Sunday Press Books' The Complete Color Little Sammy Sneeze promotion: a tissue box cover depicting Winsor McCay's nasally challenged protagonist, Sammy Sneeze. Whereas the Sunday Press version is of the longer box design, I made for myself a version to fit over square tissue boxes. It features two abbreviated cartoons on opposite sides, and spotlight images of Sammy on the other two sides. I made this a couple years ago and never intended to do anything with it beyond having one in my library, but since I'm travelling and needed an "On Strips" post, I thought I might share it. If you'd like your own, you can order a poster board size sheet with two complete tissue box layouts on it here. It's printed on a high gloss paper, so you'll have to glue it to a sheet of poster board or something a little sturdier. But then you can just cut it out, glue the flaps in place, and you should be good to drop it over a standard tissue box! Plus you've got a second one you can gift to a friend!